“A very classy reverb that will endow your tone with an authentic sense of space or the ambience of a vintage studio recording”. 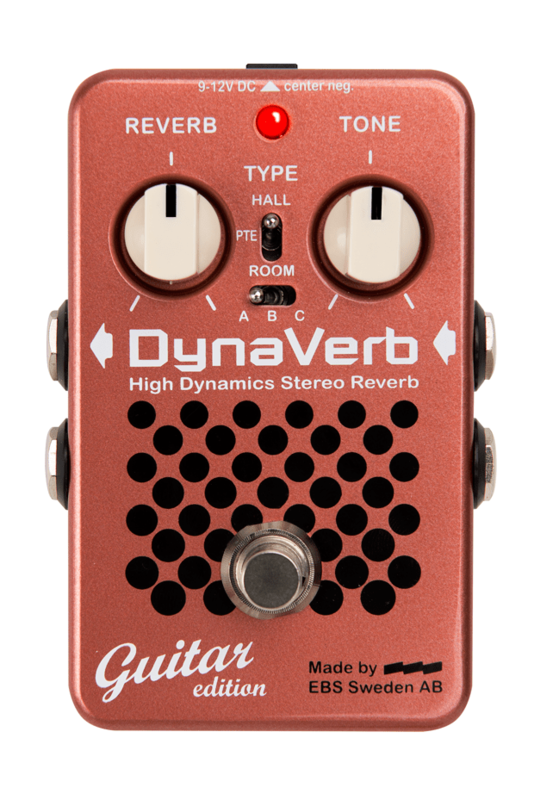 THE EBS DYNAVERB GUITAR EDITION OFFER EIGHT DIFFERENT TRUE STEREO DIGITAL REVERB EFFECTS, FROM ROOMS, TO PLATES, TO HALLS. ALL IN A COMPACT PEDAL. Outstanding performance. 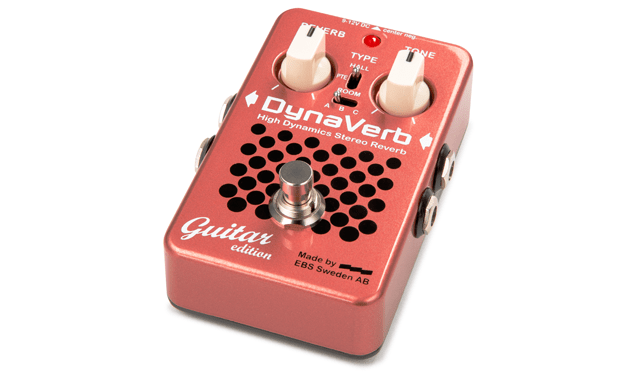 The EBS DynaVerb Guitar Edition use a 24-bit digital processing circuitry for outstanding and noiseless performance on stage and in the recording studio. It has stereo input as well as stereo out. About Red Label Pedals. The EBS DynaVerb Guitar Edition is one of the three first launched pedals in EBS new Red Label Pedals for guitar, along with the EBS Red Twister Guitar Edition and MultiComp Guitar Edition. They all comes with the heritage from EBS famed Black Label Pedals for bass, that have been used by world-famous guitarists for years. With the Red Label Pedals, all the details has been adjusted for optimal performance with guitar, with the input from some of the most busy Swedish session guitarists and the staff from the famous TGT11.se pedal specialists store in Stockholm, Sweden. “A very classy, if premium-priced, reverb that will endow your tone with an authentic sense of space or the ambience of a vintage studio recording”. - 7/10. Read the magazine for full review. “There is no doubt that the DynaVerb GE is a very good reverb pedal, clear, transparent and musical with a wide variety of settings”. "The EBS DynaVerb is the best reverb pedal I have heard. It sounds like a rack piece. Spatially and beautiful." "The EBS DynaVerb is the lushest sounding stereo reverb I know. I use it all the time under solos - awesome sound!" - Mike Scott, guitarist with Prince, Justin Timberlake etc. "The EBS DynaVerb is the best reverb pedal I have ever used!"